It is a glorious Monday for Mike Applebee, which can only mean on thing – the request he had put in for Tony Chu’s transfer has gone through and today he has the long awaited privilege of firing him. 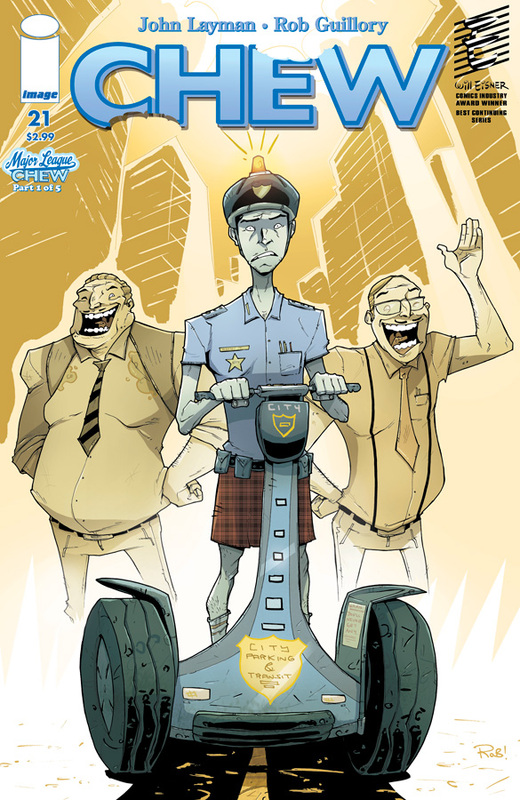 Tony now finds himself demoted to traffic patrol, a position carrying many possessive and negative aspects, the worst of it being his damaged ego and the quilted uniform he is required to wear. He quickly becomes bored of the minuscule duties the position entitles and finds himself a crime to solve; one that will hopefully aid in his reinstatement as a Special Agent of the FDA. Hailing from the glorious and award winning hands of Layman and Guillory, Chew #21 begins a new (and much less glamorous) chapter in Tony Chu’s life. He’s got the job, the girl and the talent; he stands with everything to lose but now the question remains: What wacky and wild situation will Tony find himself in next and how will his wit and charm get him out of it? Only the next 4 issues will tell. What I do know, however, is that Tony is one hell of a man and nothing will stand in the way of him getting the job done. This is a series I have been following since it’s release. The obscure and frankly demented world that is created is enticing to say the least. It follows deeply into the special-powered members of this society and constantly makes you kick yourself for never having been born with similar abilities. Such abnormalities include Cibopath’s: People who can see the history of whatever item/food they eat with the exception of beets and the most interesting of the bunch, Saboscrivner’s, which are people who can describe the foods they eat with such detail that those who read their writing are overwhelmed with the flavours described. Needless as it is to say with a story this original and prominent, Layman is a grand writer and creator. He tells the ambiguous story of Tony Chu and the world in which he lives more impressively than one could hope for and for that I give many thanks and a well deserved high-five. Not to be outdone by his counter-part, artist Rob Guillory does an impeccable job time and again of bringing Layman’s ideas to life. His cartooned approach allows for a warming welcome with each coming issue while still being odd enough to fit in with the more obscure notions presented. This is a newcomers always welcome based series in that it gives brief introductions to characters and situations throughout each issue. So, if you are a fan of food I highly recommend that you pick this up. It is a comic any foodie can enjoy and a world we could only wish existed (Minus the banishment of chicken). If you aren’t a fan of food I will remain to question if you are even human whilst still recommending this series since it is worth a read for the laughs alone.